This past weekend our Dallas, GA Chapter kicked off it’s 2018 year of programs with its Annual Squirrel Hunt! Friday night began with a feast of pork chops, gravy, mashed potatoes and all the fixings. It was good to be together again and catch up. We welcomed new boy, Jeremiah and new mentors, Ken Barre and Lee Hurley. 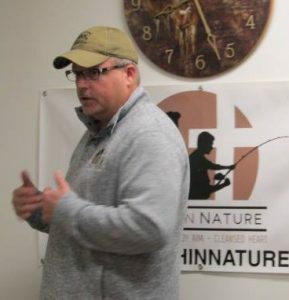 After dinner, Founder, Jeff Davis gave us an update on TIN news and new chapters coming soon in other states. Afterwards, Program Director, Don Brooks shared his heart and personal story about God’s grace and forgiveness. We don’t have to be perfect for God to love us. God’s perfect love takes us just as we are with all our faults and mistakes and He loves us too much to leave us that way. Are we living our life loving the God who loves us? Do others see God through us? Is there enough evidence to convict us of being a Christ Follower? Then we broke into small groups, where the meat of the evening happened. Boys and mentors shared their hearts with one another, their hurts, their struggles, their doubts, their fears and their victories. One of the most amazing nights of small groups we’ve seen. You could tell that God was on the move in every way. We came back together for a little competition. Who knew that a cup stacking game could be so intense! The top team then competed amongst its own members resulting in 1st place winner, Jackson and 2nd place winner, Jeremiah. We loaded up and headed to the Wallace’s bright and early Saturday morning for our Annual Squirrel Hunt. They treated us to rides in the Deuce and a Half and Humvee as they dropped off our guys in groups for the Hunt. It was ac old morning and all the boys and mentors were excited to be in the woods. The squirrels were cold too and stayed in their nests. 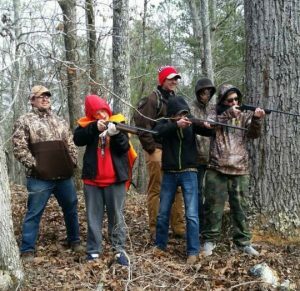 But the boys and mentors bonded in the woods and had fun target shooting and just being in God’s Creation. Although no squirrels were harmed in the making of this event, we enjoyed the hospitality of the Wallace Family and their crew in the great outdoors. After a delicious chili lunch, they spoke encouraging words over our boys as they gave them special gifts and we said our goodbyes. A huge thank you to Adventure Outdoors, Jay, Cecilia, Nick and Eric for your kindness, generosity and partnership in shaping the lives of some amazing young men. This family continues to be valuable partners to Truth in Nature to help us reach boys in the local community and beyond. Continue to lift these programs up in prayer and that God will continue to use these mentors to reach these boys. If you would like to get a young man invovled in these programs in Dallas, GA you can contact Program Director Don Brooks using the information on that Chapter Page above. You can check out all the pictures using the link below.